Musselman Updates: Summer Internship | The Gettysburgian. Musselman Library announces applications for summer internship opportunity working in Special Collections and College Archives (Banner courtesy of Musselman Library). 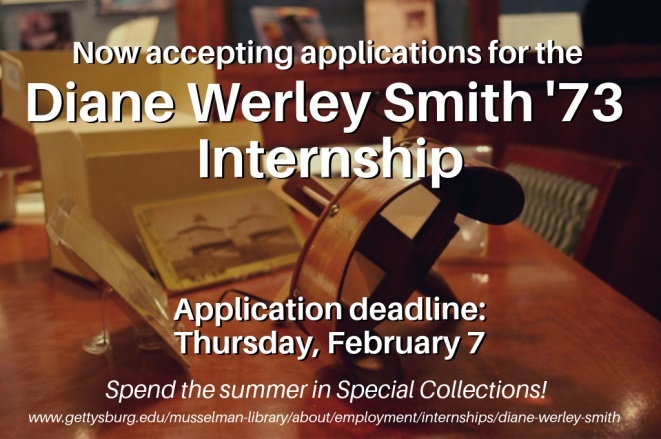 Special Collections and College Archives at Musselman Library invites current Gettysburg College students, including seniors who will graduate in May, to submit applications for the Diane Werley Smith ’73 summer internship in Special Collections. This paid internship is available to an undergraduate who is interested in exploring special collections, archives, public history, or museum studies as a profession. This internship includes independent work, while also providing collaborative learning opportunities with other summer interns. The Smith intern will gain firsthand experience while rotating through Special Collections, exploring archival processing and records management, cataloging and collection development, conservation and collection maintenance, digital projects, and more. Special Collections and College Archives is home to the College’s collection of rare books, letters, diaries, College publications, photographs, historic maps, memorabilia, artifacts, oral histories, and media, plus documents related to the history of the College. If you are interested in history, this could be the perfect summer opportunity for you! Application deadline is February 7, 2019. For more information and application directions visit the Musselman Library page on the Gettysburg College website. This internship is made possible by the generosity of Diane Werley Smith ‘73 & Ronald Smith ‘72.